Nothing could be more fundamental than the questions of: Where did we come from? Why are we here? Where are we going? Nothing could be more true than the fact that virtually no one has answers they can rationally defend with evidence and consistency with natural laws. If we do not know our origin or destiny, then we cannot know how to properly live. The world's precarious state, and the prevailing sense of futility and meaninglessness are symptoms of either having no answers, or having the wrong ones. Experts have reached no consensus in spite of thousands of years of trying. So the average person either latches onto some convenient and attractive belief propped up with desire, hope, and faith, or gives up and ignores the topics altogether. This book offers the promise of turning that all around. It is the only book that sets aside evolutionary and religious bias to reveal the truth manifest by reason, evidence, and experience. If read openly and honestly, what you hold in your hands has the potential to totally revolutionize the scientific, philosophic, and religious worlds. When we approach the big questions as if thinking matters, we are led to exactly where the world needs to go, a place of honesty, truth, confidence, solutions, and love. Dr. Wysong masterfully teaches us how to reach within, use our own minds, consider the evidence honestly, and remain open-minded. The result is beautiful in its simplicity and wonderful in the hope, meaning, and purpose it brings. "Mind opening, life altering. My world was turned upside down, but I found out it was not right side up after all." "This was hard to read at times. But as I continued I began to realize that my bristling was simply because of my passion for beliefs that I had never really examined. He helped me see that the only thing I had to fear was the fear of losing beliefs I had no business owning in the first place." "Each of us stubbornly holds to ideas implanted in our brains by society. We seem to fear truly thinking for ourselves… I even felt tears well up as I discovered the promise that existed in my own mind—and for the world." "The first book of its kind that does not end up trying to shackle the reader to some presupposed given truth. A true open-thinking journey; a real inspiration." "A daring tonic teaching fundamental truths. 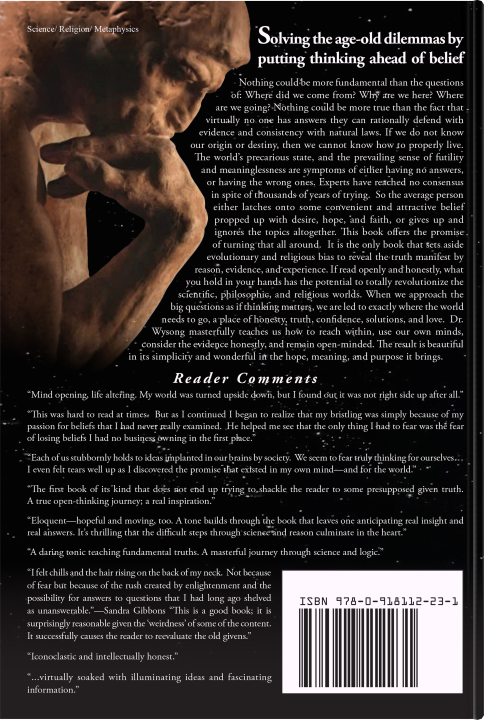 A masterful journey through science and logic." "This is a good book; it is surprisingly reasonable given the "weirdness" of some of the content. It successfully causes the reader to reevaluate the old givens." "Eloquent—hopeful and moving, too. A tone builds through the book that leaves one anticipating real insight and real answers. It’s thrilling that the difficult steps through science and reason culminate in the heart." "I felt chills and the hair rising on the back of my neck. Not because of fear but because of the rush created by enlightenment and the possibility for answers to questions that I had long ago shelved as unanswerable." "...virtually soaked with illuminating ideas and fascinating information." "I could go on and on but I'll stop here and simply say that the Big Questions was a monumental work and you accomplished what you set out to do-you made people think!" The origin of life debate strikes at the very heart of who we are. So emotions run high and commitments run deep. But nobody was really there in the beginning to tell us the truth. The only reliable compass we have is the honesty of facts and our unencumbered reasoning faculties. Instead, an array of beliefs have become sacrosanct to scientists, religionists, educators, academia, and the public at large. That matter at its smallest level is solid pieces of something. That our four material dimensions define the limits of reality. That matter, energy, and scientific laws have ever, or can presently, come to be from nothing. That there is any spontaneous force that can cause the organization of inorganic matter into anything as complex as the simplest living cell. That a simple living cell can arise spontaneously from inorganic elements without the interjection of intelligence. That an organ such as a complex eye, liver, heart, brain, or wing can arise spontaneously through a logical and natural progression of incremental genetic, biochemical, and structural steps, and that each increment is more beneficial to survival than its predecessor. That creatures can evolve incrementally into different creatures with new functional organs, and that each increment is more suited to survival than its predecessor, and that the new creatures, if given access to their predecessors, will not and cannot breed with them and revert to the original form. That something other than intelligence is the best explanation for the existence of the universe and life. That free will and self-awareness can be traced to the properties of atoms or molecules. That all the thoughts humans experience are initiated by the brain, and that a specific neuronal and biochemical mechanism can explain the origin and makeup of each thought. That there is anything within the scope of our scientific understandings—including quantum physics—that would preclude paranormal and preternatural abilities and events. That all psychic abilities can be duplicated by mere guessing. That there is anything in existence, or any phenomenon, that is super-natural, that is, beyond nature, truth, and reality. That a human’s self-awareness ever ceases. That a particular oral or written communication is the literal word of the creator of the universe and can be understood by all humans the same. That any human has the logical or ethical right to attribute to the creator of the universe the authorship of any communication known to be written or spoken by humans. That there are any doctrines derived from holy books that cannot be traced to ordinary people who predated the writers of the book. That any ethic or action beneficial to life and happiness of humans cannot come from individuals using reason and conscience. That faith (materialistic, evolutionary, religious), as opposed to reason guided by evidence, is better suited for guiding humanity to health and happiness. Written to challenge and stimulate the deep thinker, yet be understandable to all, this is the book that sets the new course in the origin of life debate. It is a must read classic for any thinking person. 12 Are We Selected Mutants? Anyone who has struggled with the Big Questions is well acquainted with frustration, if not terror. The sheer enormity of the questions makes answers seem impossible. For example, although we know infinity exists, nobody can comprehend it. So in our farm-it-out age we look to experts and scholars in science and religion who claim to have it all tidied up for us, or simply accede to what our parents believed, what was taught in school, or to popular opinion. Moreover, we're influenced by financial interest, pride, security, prejudice, acceptance by peers, fear, hope, ego, social station, allegiance to friends and family, and laziness. These motives obviously impede an honest search. And honesty is important since the answers we hold form the very foundation of our view of life and the world. That view shapes beliefs which in turn produce actions that serve to either better or worsen existence. Certainly you come to this book with at least some notion of answers. But if you haven't earned your belief with open-minded inquiry but, along with carefully groomed and selective proofs, were handed it by an institution or another person, you're most likely wrong. Unfortunately it's easy to accept easy-open prepackaged beliefs that help with our fears and desires. Once we adopt such beliefs we lock them in our brains as truths. They become habit and are as difficult to part with as any other dear part of our body, like an arm or leg. You might think that this book will be just another opinion. But note the most important part of the book title: As If Thinking Matters. So I'm not going to try to get you to join anything or pledge. Rather, this book is a guide to intellectual self determination. You will be reacquainted with your own reasoning powers, intuitive senses, and introduced to or reminded of facts that affirm what you already know but have set aside in favor of belief in someone else's belief. Thus you'll likely find exhilarating "I knew that" realizations throughout that you can own because you unearthed them from your own consciousness. You'll be surprised, as I have been, by what's possible once the mind is fearlessly opened, biases set aside, the full array of facts examined, logic applied, and a commitment to finding truth becomes priority. In other words, proceeding as if thinking matters. This has been my awakening experience over a lifetime and I want to share that with you through this book which has taken thousands of hours and decades to ponder, research, and write. Since virtually nobody comes to these pages with a blank mental slate, some undoing will need to be done in order to build answers. Yes, everyone cherishes their beliefs. Having them challenged is not comfortable—to some it is as if life itself is being threatened. Moreover, it's easier to fool someone than to convince them they have been fooled. But dismantling popular ideas is necessary in order to remove the clutter blocking the light of truth. It is my hope that I can convince you that self sufficiency and owning your own mind and ideas are vital. However, I know that reliance on one's self, rather than others, is not easy. It means work, the hardest work of all, thinking. Sadly, for most people, change must be easier than habit. For the rest who are willing to take this journey into self exploration, be patient as you course through the book. 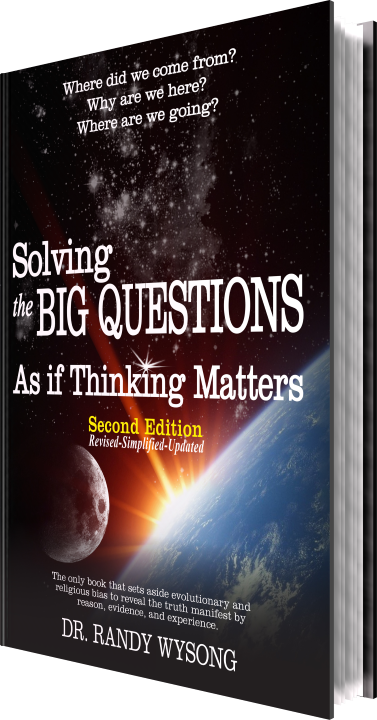 From the ashes of the false beliefs that are exposed you will derive meaningful and hopeful answers to the Big Questions. Try hard to set preformed beliefs aside and start from zero. If truth is the goal, there's nothing to fear. Please read sequentially since each section and chapter provides the basis for the following ones. If you object, become upset, or feel I'm not being true to the purpose set forth, please read on. 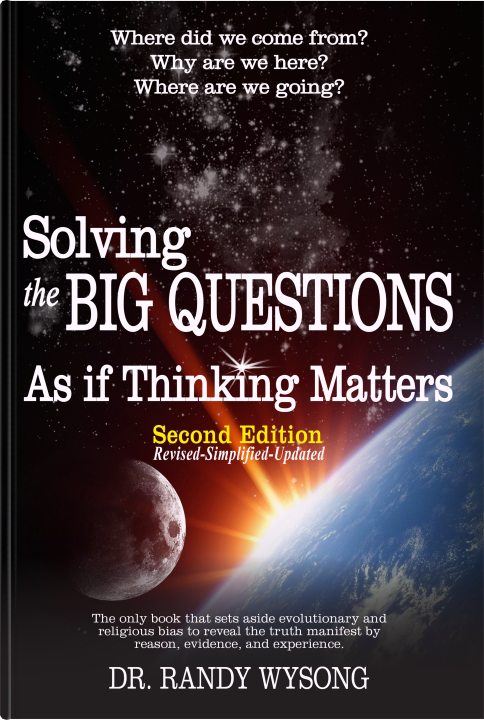 If issues or questions remain after completing the book, feel free to contact me at: asifthinkingmatters.com. IN THIS SECTION: There is truth in an absolute sense, out there waiting for discovery. But finding it will not be as simple as keeping beliefs we were spoon fed as a child or following popular opinion. Let's start at the only place from which truth can be hoped to be viewed but where few people dare to begin: with the honesty of an open mind and the courage to fill it only by reason and evidence. If scientists and engineers want to build a skyscraper, put a person on the moon, develop a recyclable plastic, maintain a nuclear power plant, or make parachutes, they must follow rules. Those rules are derived from the truthful natural laws of math, geometry, chemistry, physics, genetics, and so on. They dictate reality and thus success or failure. Meaningful answers to the Big Questions, or anything else for that matter, require truth. But truth is like a fighting word. Any claim to it is thought pretentious and met with suspicion, if not derision. Humans have been there and done that with all the ridiculous and failed "truths" throughout history. IN THIS SECTION: The origin of humans and the world in which we live is one of the most intriguing and important questions we ever face. Religions claim to have the answer. Evolutionists say they have a better one. Perhaps one is right or perhaps they are both wrong. We will never know unless we leave our beliefs behind, approach the question as if thinking matters, and let the evidence lead. The predominant opposing views on the origin of the universe and life are religion and evolution/materialism. But there is a third one too, secular creation, although that option is virtually ignored by everyone. Don't let this title scare you. As you will see, the takeaway from this chapter is so simple every child knows it. Evolution means that physical reality holds within itself the capability to cause the origin of itself and the universe. Moreover, matter, energy, and natural laws serve as the only needed raw materials for the appearance of the universe and life with its transformation into increasingly complex organisms. It used to be thought that babies grew from a very small version of the same thing—termed a homunculus. From a Bible perspective, this neatly explained how it was that "in Adam all had sinned." The whole of humanity resided within his loins (homunculi within homunculi within homunculi...) and so when he sinned so did all of his contained homunculi, giving us all an "original sin" requiring a savior. From a practical standpoint, our lives are guided by what we believe to be possible and what we think is not. I think it's impossible to fix my computer with a hammer. I think it's very possible that a computer technician can fix it. Such practical reasoning occurs on a daily basis with all of us and makes life livable. Spontaneous generation is an old belief that life automatically arises from nonliving matter. It was a reasonable thing to assume in the pre-scientific era since there were no microscopes to identify what caused critters to pop out of manure and mud. For life to arise spontaneously out of inorganic matter, as evolution demands, basic building blocks such as amino acids (precursors to proteins and enzymes), sugars (precursors to carbohydrates), glycerol and fatty acids (precursors to fats), and nucleotides (precursors to DNA and RNA) must first form. Time's arrow is downhill toward disorder, not upward toward the functional complexity of the universe and life. Nevertheless, evolutionists attempt to use time, vast time, as a proof. The universe is said to be 17 billion years old, and the Earth about 4.6 billion years old. Those ages, as will be explained, are by no means absolute. They are selected from many possible ages to give evolution its breathing room. The golden ages of evolution that are thought to be buried in the fossil record are presented in textbooks as if there is clear evidence that life emerged spontaneously and then gradually evolved from simple to complex. If one digs down into the earth, that is the fossil history expected to be revealed. 11. ARE WE SELECTED MUTANTS? If we examine actual human history and artifacts, evolution is not seen. There is no proof that humans have, for example, gained intelligence. If anything, we seem to be less capable than our ancestors. We have devolved. The engine that is supposed to propel evolution needs to have the muscle for shape shifting one kind of creature into another. That engine is described as neo-Darwinism, the combination of mutations to create genetic variations, and natural selection to winnow out the most fit variants. Given the fact that evolution violates the natural laws and logic outlined in the previous chapters, it would seem that the case would be closed. But natural laws and logic are ignored in favor of superficial arguments and specious proofs. Evolution belief has percolated through the masses taking on a grandeur that does not fit its intellectually homely underpinnings. That's in large part because it is thought to be the only alternative to untenable religions, or it's what our teachers believe, is intellectually vogue, and justifies amoral freedom and unaccountability. Facts, logic, and evidence barely have a chance against those powerful reasons to accept and retain this belief. IN THIS SECTION: The application of logic and a fair consideration of the evidence proves that mind, not matter, underlies our reality. If our reality is the mere product of matter and energy interacting over vast stretches of time, the qualities we and the universe possess should be fully attributable to those agents. And the materialist has confidence that this is so. After all, if there is a question about why a bulldozer works, just start disassembling it into its gears, nuts, and bolts until the answer emerges. On the face of it, the detailed intricacy, roiling complexity, and staggering functionality of our world all point to intelligence. That is the common sense conclusion humans have made since the beginning of time. That's because intelligence leaves a recognizable trail. If you were on the outside looking in on our universe, you would see not only order, complexity, and repeating patterns, but motion as well. Our universe is an outlandish array of moving machines within machines. There are lightning fast quantum and atom machines, molecular and biochemical machines, worm and elephant machines, and solar system and galaxy machines moving at millions of miles per hour. And they all interrelate with one another in a gigantic intricate and interconnected moving web machine. In a previous chapter I discussed a geared computer dating to 205 BC. The point being that such a mechanism demonstrates the incredible intelligence of humans over 2000 years ago. How such an intricate mechanism could be designed and made before modern capabilities and tooling is a total mystery. If living things were designed, no more glaringly evident signs could be present. All life is a staggering array of "in your face" mystery and complexity all the way down to their atomic and quantum levels. Humans, in particular, defy evolutionary explanation. Over and over throughout the universe, natural relationships and laws come together to create millions of circumstances perfect for the existence and continuance of life on Earth. We could not be alive for another second were it not for the billions of coordinated events that occur so perfectly in our bodies. Outside the body, throughout the universe synchrony must occur for us to exist. The universe is put together so perfectly, so anthropically, as it is called, to accommodate us. Origins is not just a question for science, academics, or casual musing. It is the foundation for belief, and belief has to do with how we live our lives and how we justify them. When we don't approach life and the questions it presents as if thinking matters, there are consequences. Let's examine how poor thinking on origins gets us into trouble. IN THIS SECTION: People do not come to the subject of religion using reason and evidence. Instead, belief and faith are thought necessary. But they aren't. The universe is scientifically true, rational, and without contradiction. The cause of that universe should have those same qualities, as should any religion that puts itself forth as representing that cause. The disproof of evolution/materialism and the arguments for intelligent design are used as proof for manmade religions and holy books. That's because religions are thought to be the only alternative to evolution. Let's start this analysis of religion from the only place we should begin, our own minds. That's because we are not born with the institutional ideas present in man-made religions. That much we know for sure. Religious ideas are schooled into us by fellow humans. Religion did not begin with cathedrals, clergy, doctrines, and holy books. It began with a human in a natural state.. In my college years I moved from the Christian religion of my parents into the prevailing academic evolutionist view. Then, in my early medical years, I discovered some of the evidence and logic presented in the previous section of this book. This convinced me there had to be a Creator but I really didn't know where to go from there. Lingering childhood church memories led me to think that if I wanted to know more about the Creator, religion was the place to look. It would then be just a matter of finding out which religion was the true representative of the Creator. The whole idea of the Creator of the universe writing a book plagued me after I discovered the manmade pagan roots of modern religions, including mine. So I explored the origin of holy books, particularly the Bible. In my foray into history as it relates to holy books, I learned that beliefs based upon events of the past are best derived from reliable evidence, such as eyewitness accounts, artifacts, archeology, paleontology, reliable dating, and self written documents. That is the preferred evidence used by credible historians. The information I only touched upon about religious history, mythology, and the uncertainty of manuscripts and language, particularly ancient ones, left me confused. But I could still brush aside any skepticism about the Bible being the word of the Creator. That's done by reasoning that if an omnipotent Creator wanted to write a book and make sure it was transmitted perfectly, imperfect and even evil scribes and rulers would not be able to stand in the way. When I was immersed in my religion I ignored the holy book problems outlined in the previous chapter. The Bible god killing the first born of an entire nation, telling Jews to stone disobedient children and slaughter unbelievers but keep the young maidens for pleasure were just glossed over as some sort of moral lesson about obedience. It is amazing what the mind can justify in service to an ideology. The ace in the hole for many Bible believers is prophecy. For example, one Internet Bible apologist proclaims that "2,500 prophecies appear in the pages of the Bible, about 2,000 of which already have been fulfilled to the letter—no errors." My adopted religion gave answers to the Big Questions of existence and righteousness was a prevailing goal in the congregation. Its end time theme also engendered a sense of urgency to help others be saved. The community, camaraderie, shared beliefs, and goal of saving the world were all a strong pull for me and my family. Most religious believers don't bother with the nitty gritty details and work required to intelligently argue their beliefs. Instead they claim faith, which, by definition, requires no defense. Even highly intelligent people working in the sciences and applied fields where strict proof and evidence are required will proudly proclaim religious faith. It's human to seek to be good. The struggle between right and wrong, good and bad, underlies and pervades every religious, political, legal, and social institution, and has from time immemorial. Equity, justice, propriety, social graces, respect, honesty, and so on weigh on each of us personally each and every day. IN THIS SECTION: Although it seems that our world is the extent of reality, it isn't. Reason and modern physics prove that matter is an illusion. Real reality provides boundless possibilities beyond the constraints of time and physicality. Once I realized that evolution and religions were false concepts, it seemed there was nowhere to turn. Even though it was exhilarating to shed such encumbrances, the comfort of having everything all figured out was hard to leave behind, particularly with the remaining looming questions of destiny and death. The most compelling evidence any of us will ever be faced with is personal observation and experience. No argument, no matter how erudite or authoritative, ever defeats direct experience. So, hoping you will not take the position of the anonymous person who said to Margaret Mead, "This is the kind of phenomena I wouldn't believe even if it were true," let's begin this interesting and exciting exploration with something you can experience right now. I hope you were successful with your dowsing experiment. If you were, nobody is going to convince you that what you experienced did not happen, correct? It doesn't matter that there is no explanation, that conventional science has no clue as to what the forces are that cause the wires to move, or that your friends won't believe you if you tell them. Now I understand that all the weird human things catalogued in the previous chapter can tend to stretch believability due to the human element. People can exaggerate, distort, fabricate, be delusional and outright lie. But keep in mind that so many lines of evidence and even scientific studies are in support. If you think back through your life you will probably recollect experiences that are in keeping with some of the examples cited in the previous chapters. I can lay claim to none of the extraordinary abilities. But I have experienced déjà vu, contagious yawns, anticipating phone calls, guessing the time, dowsing, and witnessing some unusual animal capabilities. For those who have experienced the paranormal and preternatural, no further proof is needed. No argument ever defeats direct experience. Nevertheless, self doubt can arise since the paranormal flies in the face of popular religious, educational, and scientific thought. Many who have such experiences remain silent for fear of ridicule. Given reason, science (quantum physics in particular), and the evidence of phenomena outside of materially normal bounds, weird things are just real things we are unable to easily grasp. There is no supernatural, only natural. No paranormal, only normal. But without this understanding, weird things are not a gateway to exploration and enlightenment, but rather an opportunity for dimensionally stuck brains to witch hunt. IN THIS SECTION: Matter cannot account for our complexity, consciousness, and free will. We are, therefore, something other than the body we occupy. Free will is such powerful evidence that we are other than mere matter and not limited by it. The atoms of matter don't have within them the free will which living things possess. At the chemistry level, atoms simply obey natural laws that make their behavior perfectly predictable. Obedient atoms are what allow chemists to mix a batch of certain atoms and molecules together to produce plastic food wrap and count on not getting Coca-Cola coming out of the extruder. In my scientific and medical training and studies I came to believe that we are just a physical stimulus-response mechanism controlled and directed by an electrochemical computer made of meat—the brain. Consciousness was a mere epiphenomenon, a by-product of matter and confined to inside the head. We instinctually fear death because mortal survival is programmed into us. It's also an unknown, an unknown to which some religions have attached the horror of eternal hell. Death is also associated with the pain that may precede it. If you have come this far with me you will see that the facts, logic, and science we have explored up to now funnel us into a whole new way of looking at who we are, why we are here, and where we are going. Admittedly, it's very hard to reconcile an often cold, heartless, and chaotic world with a Creator capable of interceding. It was not until the realizations outlined in this book came to me that it became clear that there are actually very good reasons life is as it is. In fact, problems and suffering are proof of love and purpose, not a denial of them. Here's why. •Truth exists, as evidenced by natural laws. Truthful answers to the Big Questions must therefore be measured by their conformity to these natural laws, along with reason, evidence, and experience. electronic or mechanical, without express written permission of the copyright owner, Inquiry Press.